← Does Democracy Really Exist? I often felt that the Cybermen came across as a somewhat pathetic race. While the concept behind them is very creepy, the execution rarely lived up to their potential. Supremacy of the Cybermen, however, managed to make them seem much more threatening than they have ever done before. The story is set sometime after the events of the TV episode “Hell Bent.” In that episode, the Twelfth Doctor exiles Rassilon from Gallifrey and the comic explains what happens next. He was soon found by a group of Cybermen to whom he imparted the secrets of time travel. They exploit this power to then resculpt all of history in their image, with horrifying results. The story starts from the Twelfth Doctor’s perspective and we then find that Gallifrey has already fallen to the Cybermen. As the Time Lords have always been portrayed as such powerful race, this is quite a shocking opener. The story then shifts perspectives to show us how this is affecting the Doctor’s previous lives. We see the Ninth, Tenth and Eleventh Doctors going about their adventures and coming up against worryingly powerful Cyberman armies. It’s a fantastic, fast-paced story and I found myself unable to stop reading. I was so excited to find out about what would happen next. Plus, as well as being a very engaging story, the art complimented it really well too. Each Doctor has a unique art style, which adds a nice degree of variation. Overall, it’s a real treat for the fans and I think that those who love the post-2005 episodes will especially enjoy reading it. Having said that, I don’t mean to suggest that there’s nothing for fans of the earlier stuff, as it’s a story which covers a lot of ground. One thing in particular which I was quite happy about, was that this features the Ninth Doctor, Jack and Rose team, which is one of my favourites (and they don’t have much of a run on TV.) I guess I was a little disappointed by the ending, but then I suppose I saw it coming. 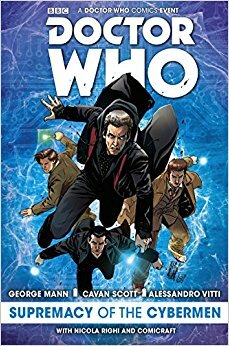 Still very enjoyable and one of the best Doctor Who graphic novels I’ve read. This entry was posted in Book Reviews, Doctor Who. Bookmark the permalink.